Every month I order a set of Mother Goose Time's More Math & More Reading work books. They are a way to take each day a little further with a child that might need a little more challenge in their day. They are design to have one page for every day of curriculum, 20 days, plus a few more pages for a quick review at the end. 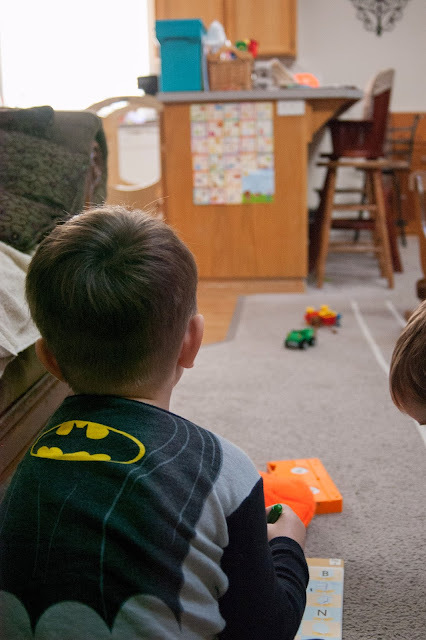 I have noticed that my boys don't enjoy this sort of sit down and concentrate sort of stuff as much as let's say, Lucy. She can sit at a coloring page and really focus on it. There are definitely gender differences but some of it is personalities as well. So if you have a little one that likes to sit and work, these would be great additions to the curriculum. 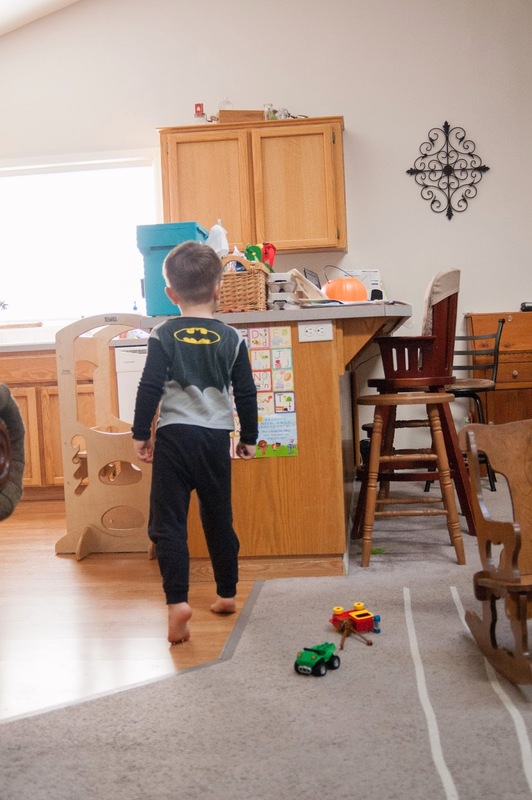 What works best for us is to have these accessible and present them to the boys when they seem in the mood. We usually sift through the pages until something catches Lachlan's eye. On this day we had just finished up Day 13 about horses. I still had their attention and grabbed the workbooks. First Lachlan counted chickens in Chicken math. It's simple, a group of chicks or chickens + another group = 12 or 13. Once he counts them up he circles the right number. He did really well. With Peter, I sort of sift through the pages with him and give him a few choices. He is very smart and can do a lot but quite a few are a bit too advanced. He is however, really good with shapes. They have a page where you count how many triangles and how many circles and so on. He also did a maze, which he loved. This was a tough page but we worked through it together. We had to match the letter with the picture. So I helped him sound out the letters and sound out the pictures. Since Peter did a maze, Lachlan wanted to as well. He had to try to get the Farmer to his garden. But the big success of the day was on this page. This is his finished page. I am so proud of Lachlan on so many levels for this accomplishment. But first tell you how we walked through this page together. 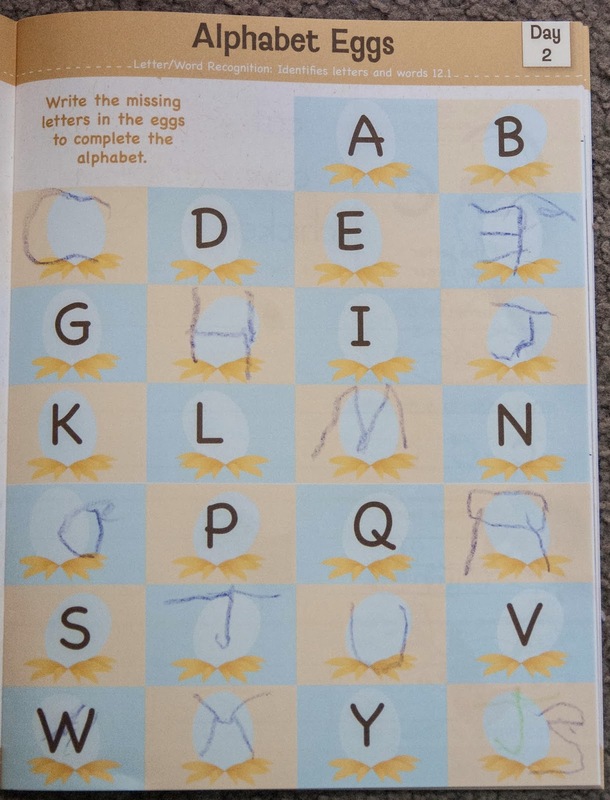 On this page it lists the alphabet with a few missing letters for the child to fill in. I started at A each time we had a new letter to fill in. So first I said A, B _____, then I would pause at the blank. Lachlan would with out skipping a beat be able to fill in the blank with the correct name of the letter. Next I would ask him if he knew what that letter looked like. If he said no I would guide him to our alphabet chart. The letter C has a /c/c/car and /c/c/cat on it. So he would go over to the chart, find the letter and study the letter. Next he would come back to me and write the letter in the air to show me what the letter looked like. Here he is writing a letter in the air but I cut off his poor little finger. You can still see the concentrations and pride in his face though. Next he would sit down at his page and write it down. 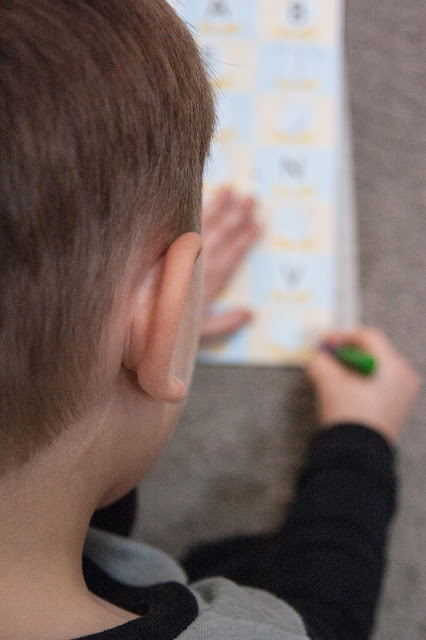 Sometimes looking back up at the alphabet chart to study the letter once more before writing. He would lose track of which egg it was supposed to be written on and would ask me to show him the correct. 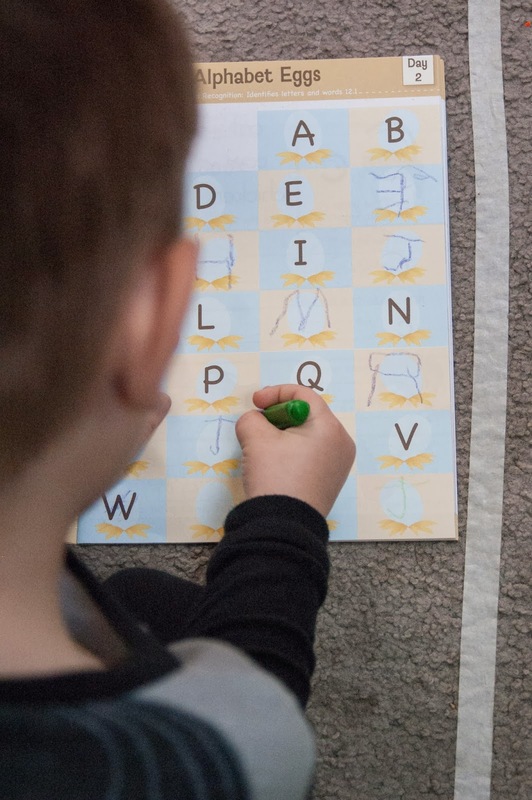 Writing in the last letter of the alphabet, Z, with out even looking at the alphabet chart. He didn't get it perfect but pretty darn close. As you can see, the letter F is written backwards, but the rest look pretty darn good. The letters O, U, X and Z he wrote in all by himself with out looking at the alphabet chart. We had just that day had a lot of fun with the letter U. It was tied in beautifully to the shape of a horse shoe and he picked it up like it was nothing. So when we got to U it was synch. When we got to X I reminded him that X marks the spot (from our potato lesson). That's all it took and he got to work on his X. Instead of drawing two intersecting lines he wrote 2 almost U shapes touching. But you can very easily see that it is an X. 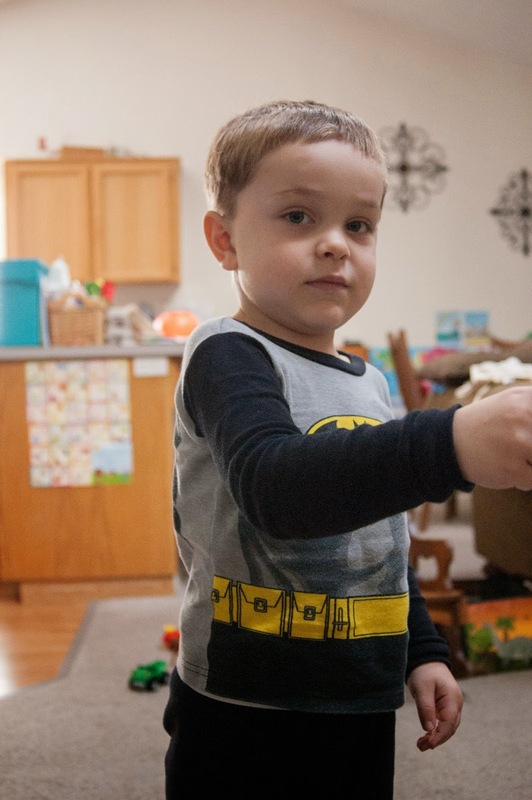 There are so many parts to this that make me proud and are BIG strides forward for Lachlan. First of all this was like page 5 that we were working on, after finishing a whole day of curriculum. So this is a big period of time for Lachlan to stay focused. This was also one of the first times he took direction from me with out getting too upset. He began to write the F backwards and I told him the lines come out the other side. He tried to correct it and then went back to how he was doing it and I didn't push him. But he responded really well to my guidance. He was also holding the crayon properly. 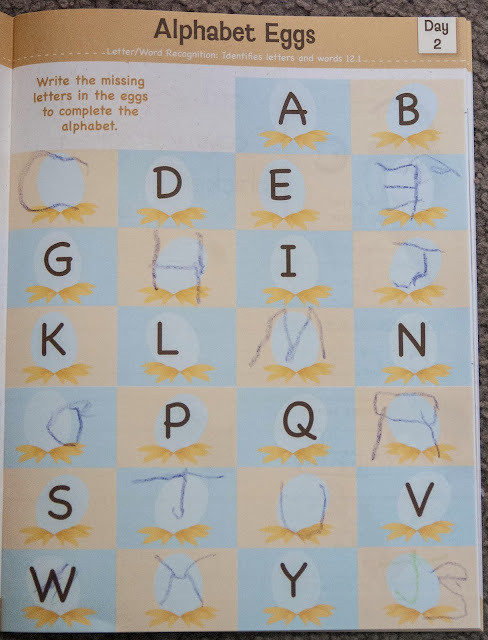 Not to mention the fact that he was free handing these letters by simply studying what the letter looked like and then writing. This was maybe the second or third time he ventured into this new realm. It's amazing how these skills just seem to blossom over night and how they all tie together. With MGT we have done a lot of drawing. At first Lachlan couldn't really do this. If I asked him to draw a picture of himself he didn't know where to start until I started walking him through the shape of his head and the shape of his eyes and where to put them. Now he can look at something and start to draw it. I realize now that this skill is not just tied to writing by simply hand strengthening and fine motor skills. But it's slowly building this ability to look at something and then try to replicate it on paper. This transitioned beautifully to letter writing with out frustration and with out tracing on this worksheet. This has also reiterated to me why I am so thankful to be doing preschool at home with Lachlan. We can go at his pace, when he is ready. No pushing or pressure, and therefore no frustration of learning. I know that there are kids that thrive in a school environment and that pressure is a positive thing for them. But at this point, it's not the right fit for Lachlan. Lastly, I would have been heart broken to have missed this victory for Lachlan. 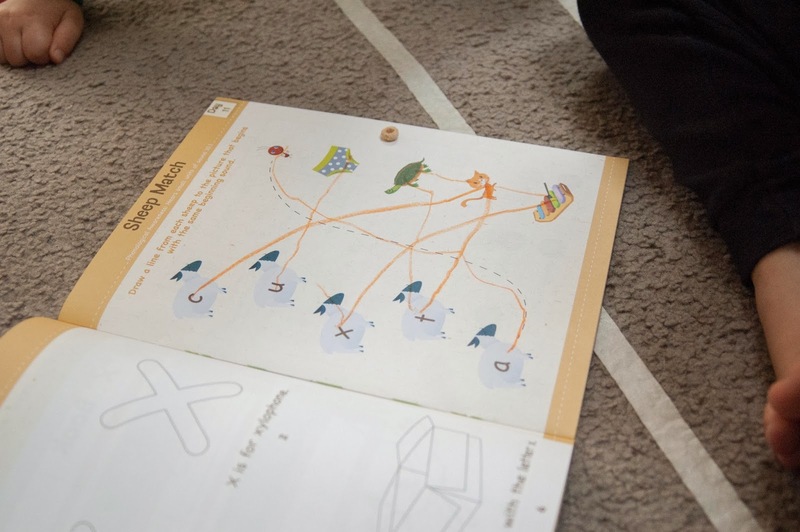 I wonder if I had not had this and many other moments with him learning at home, if I would realize what every little mark on that paper truly meant. 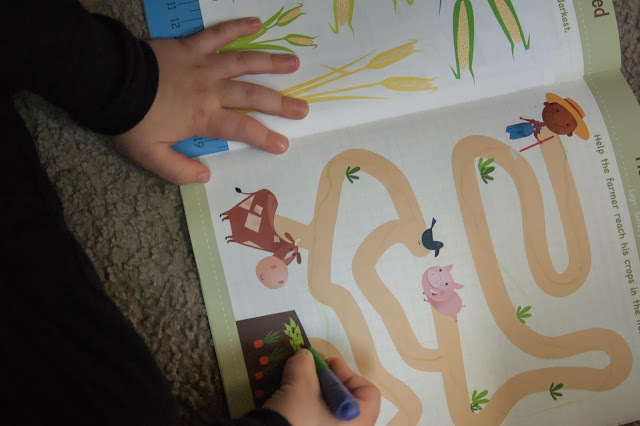 The development of skills it took to get there and the shear determination and building of character it took to get all the way through the page. If he brought that paper home to show me with pride would I truly understand the weight it carries? Some of you may be thinking, wow, this lady is crazy. So much weight put on one simple little workbook page. But for those of you who have sat down and witnessed your child accomplish something for the first time, I think you know what I am talking about. School is not just about learning, reading, writing and arithmetic but so much more. It's about these moments of tremendous character growth and celebrations of victories that come from hard work and determination. The best part of all of this is when he looked at me with glee and said "see, I am going to be a teacher." Awe that is so so sweet! Way to go Lachlan!